The holiday season can bring out the best in all of us, as we try to give our friends and loved ones gifts that can lighten their lives, brighten their smiles, or tickle their funny bones, and for the next month or so, many of us will be on the constant lookout for that perfect present. Of course, if we’re to be completely honest, it’s also a great time to shop for ourselves, thanks to the huge discounts, seasonal sales, and other incentives that are often available this time of year. What if you could give a holiday gift, either to your family or loved ones or to yourself, that could go on giving, year after year, decade after decade, by not only producing something they use every day, but by also producing it sustainably and ethically, at a lower cost to both them and to society at large? Granted, this gift isn’t a little bauble that can simply be picked up by spending a little folding money at the corner store, but is rather a sizable investment, at least if purchasing it is preferred (and it is by many), unless you choose to go the leasing route (which may get you a $0-down option). However, the good news is that this investment is a solid one, offering returns as good as, or better than, many stock market investments, so it’s a much wiser use of money than say, buying a new car (which generally costs more than this gift would, requires regular maintenance, and which depreciates rapidly in value). If this sounds appealing to you, then you’re in luck, because there’s never been a better time to buy this gift, as prices have dropped considerably over the last couple of years, and there are incentives aplenty for purchase and leasing, as well as a variety of financing options available. The gift I’m talking about, of course, is a solar energy system, such as a home rooftop solar array or a business-sized solar installation on-site (because your business could also benefit from this pathway to reduced electricity costs and a smaller carbon footprint). There are other options, however, if you/they don’t the roof or have the space, such as buying in to a community solar garden, which will allow you to pool your investment with others and still get the benefits of solar, even if it’s off-site. It’s helpful to remember that holiday shopping doesn’t always have to mean holiday ‘buying.’ A free solar quote from a trusted and experienced solar installer can be the equivalent of window shopping, and will allow you to compare prices and features long before you pull any money out of your wallet. 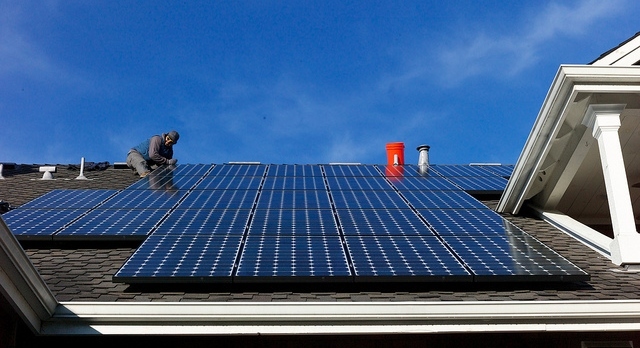 Making the decision to go solar isn’t a small one, as it does require a certain level of commitment, both financially and aesthetically (at least if you want them on your roof, which is a great location), and shouldn’t be taken lightly, no matter if you’re investigating the purchase of a solar array or buying in to a community solar project. A great place to start is by getting our free no-obligation solar report, which will give you some idea of what the general economics and parameters for going solar are at your location. After that, you can arrange to have a solar site evaluation, also at no cost, in which a professional solar contractor comes to the site and looks at the variables at your precise location, and then presents you with a proposal for an installation that would meet your needs and fit your situation. And to be thorough, a single proposal or evaluation isn’t enough information to make a truly informed decision, so it’s recommended that you ask for, and then compare and contrast, proposals from several different solar installers before deciding. If, instead of going the route of most holiday shopping and purchasing gifts that lose their value, you’d rather buy a gift that is not only useful but that also doubles as an investment, perhaps it’s time to look at a home solar energy system for either you or someone you love. Find out how to give the gift of solar today!